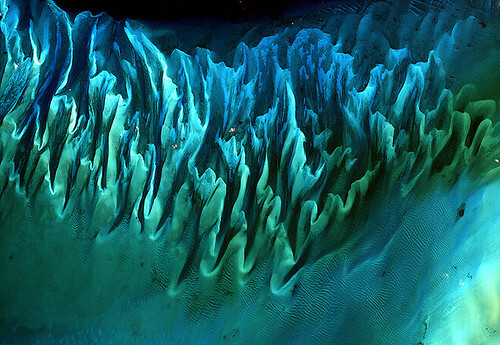 Pictures like this of ocean sands off the Bahamas are available via the Landsat app. Photo by NASA Goddard on Flickr. …Gawker’s remit was eventually so broad, news and gossip, that subject matter proved no barrier. And Gawker’s web-literate journalists picked up more story ideas from anonymous email tips, obscure web forums or hacker data dumps than they did from interviews or parties. They scorned access. To get an article massaged or fixed, there was nobody behind the scenes to call. Gawker was an island, one publicist said, uncompromised and uncompromising. Best read it now: the site will be dead soon. It’s typical to see technology coverage that simply aggregates directly from a tech company’s blog—the modern-day equivalent of a press release—with little or no analysis or additional reporting. One damning example of this lack of skepticism is evident in the early, glowing coverage of Theranos, the health-technology company that said it had developed a cheap, needle-free way to draw and test blood. It wasn’t until last year that an investigative reporter from The Wall Street Journal, prompted by a sunny New Yorker profile of the Theranos founder, began to ask serious questions about whether the technology actually worked the way Theranos claimed it did. That reporting, from John Carreyrou, encouraged other reporters to be more skeptical, too, and ultimately led to a federal criminal investigation into whether the company misled investors and regulators about the state of its technology. Investigations like Carreyrou’s—or getting inside the grueling corporate culture at Amazon, as The New York Times did last year; or detailing Google’s powerful but hidden lobbying efforts, as The Washington Post has; or contextualizing the cultural complexities of programs like Facebook’s Free Basics, as I’ve tried to do; or establishing a drumbeat of smart, in-depth coverage of the fight between Apple and the F.B.I.—is the only way to begin to understand the complex social and political impact of technology. Want to explore our constantly changing Earth through high resolution multi-spectral satellite imagery? ObservedEarth simplifies the process of obtaining, processing, and visualising earth observation data. …ObservedEarth downloads unprocessed satellite data which is then processed locally on the iPhone/iPad, this enables much greater flexibility in the range of visualisations that can be offered. Raw data consumed by ObservedEarth is often available within hours of the satellite passing overhead. Enthusiasm about the potential for Pokemon Go (and augmented reality gaming in general) to improve Nintendo Co Ltd.’s financial performance sent shares parabolic after the app launched in the U.S., and even spurred rallies in secondary plays linked to the success of the game. 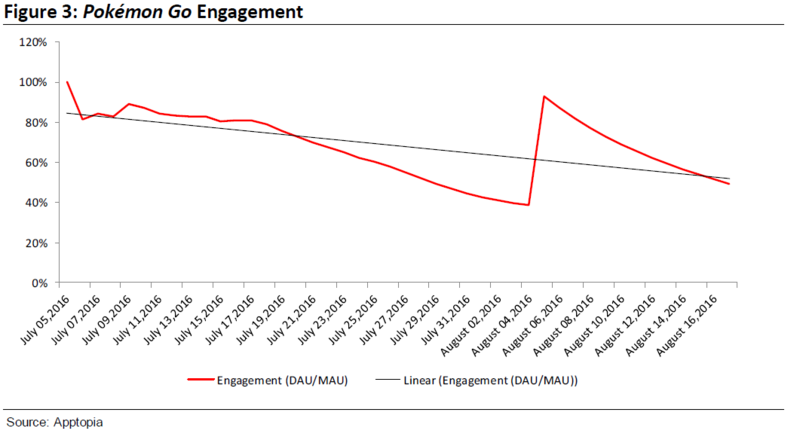 Data from Sensor Tower, SurveyMonkey, and Apptopia, however, show that Pokemon Go’s daily active users, downloads, engagement, and time spent on the app per day are all well off their peaks and on a downward trend. “The declining trends should assuage investor concerns about the impact of Pokémon Go on time spent on the above named companies,” writes Anthony. 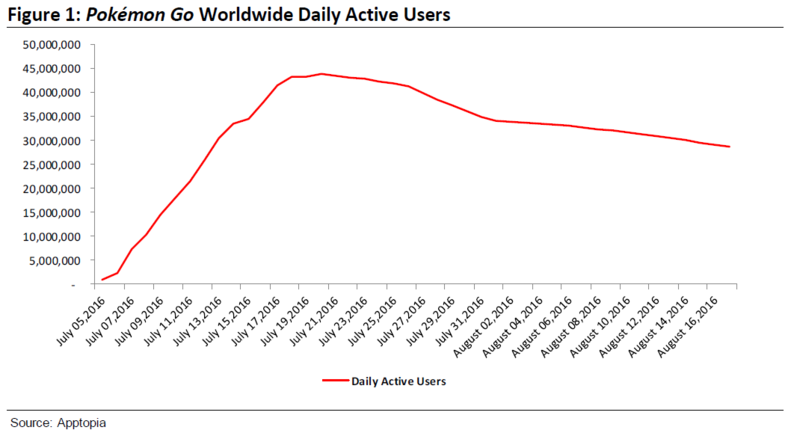 If these declines prove enduring, this would cast aspersion not only on the viability and popularity of Pokemon Go, but augmented reality gaming at large, according to the analyst. “The Google Trends data is already showing declining interest in augmented reality, whereas interest in virtual reality remains high,” he concludes. there are real business applications for similar augmented reality (AR) technology that have already proven themselves in the market. New research from consulting firm Deloitte bears this out. Out of 500 mid-market companies surveyed, a whopping 89% said they already use augmented reality in their businesses. That may be surprising until you realize that companies like Hunter Douglas has offered an AR app for Apple devices for several years that lets you preview how a given window treatment will look in your own room before you buy it. AR is different from virtual reality in that AR incorporates the real world into the view, while virtual reality, as enabled by products like Oculus Rift, builds an entirely new, all-immersive world. Steve Keathley, deputy chief information officer for Deloitte said AR comes in handy for any application that requires a sneak preview of what a finished product will look like. For Android’s primary platform (still phones and tablets), there’s a myriad of improvements. Nougat brings a new multitasking split screen mode, a redesigned notification panel, an adjustable UI scale, and fresh emoji. Nougat also sports numerous under-the-hood improvements, like changes to the Android Runtime, updates to the battery saving “Doze” mode, and developer goodies like Vulkan and Java 8 support. You could skip to the final page – with the conclusions, and the observation that as nice as Nougat is for large-screened phones, most probably won’t see it. Marshmallow is a year old; about 15.2% of Android phones contacting Google Play have it. That inertia will probably get worse as the user base grows, and cheaper phones which don’t get updated are more prevalent. Just as television makers Zenith, Motorola and RCA were eventually replaced by Japanese names like Sony, Sharp and Panasonic, so too will Chinese brands overtake the US market. The latest entrant looks set to be Xiaomi. The richly valued upstart appears ready to dip its toes in one of the world’s most important electronics markets. While China is larger by volume, the US is lucrative because average device prices are much higher. We will lead with social media, with the channels that allow us to get in touch with the young generation that are enthusiastic about new technology. We are definitely going there. Xiaomi’s entry into the US has been in doubt on concern that the Chinese company, which has been widely criticized as a wholesale copycat of Apple and others, would immediately face intellectual property lawsuits. However, Xiaomi’s purchase this summer of around 1,500 patents from Microsoft seems to have quelled those worries and given the Beijing startup the courage to move directly onto Apple’s home turf. Good point about the TV sets. That is what smartphones are becoming – though more personal. Every year we notice the same pattern: new Galaxy device comes out, it gets positive reviews (excluding, perhaps, the Galaxy S5), and among one of the positive points, you usually find performance… somehow. This is something that, of course, varies from publication to publication. But in general, the story is the same year after year: we see the breakdowns from the more-mainstream publications speak positively about these devices’ performance, somehow suspending the otherwise year-long notion that Samsung’s software is in dire need of a serious rework. It’s not uncommon to see the same publications, or even the same reviewers, then admit that the devices had slowed down since their review was printed, often in such tremendous ways that make us forget that advancements like project TRIM ever happened. The Galaxy Note 7 has just come out, and with Grace UX – Samsung’s thorough redesign of TouchWiz – coupled with top-of-the-line components, we would hope this trend would be reversed on both fronts — coverage and reality. Odd how the reviews tend not to have used it for as long. Remarkable how XDA Developers should be the site to point to this. Keep that thought. Samsung’s music service, which you didn’t know existed, stops existing next month. As Variety reported earlier, Samsung will shutter Milk Music on Sept. 22. It joins Samsung’s Milk Video in the Graveyard For Samsung Media Services No One Wanted Except Samsung Executives. It’s easy to pick on Samsung here, but they’re not the only company to overestimate the power of a distribution platform. It’s true that you can’t get media/apps/services to customers without access to a platform. But control of the platform doesn’t mean customers are going to use your media/apps/services: They’ve got plenty of choice, and they’ll choose the ones they want. Not forgetting Samsung’s ChatOn, closed in 1Q 2015.
in theory, any damage from charging your phone overnight with an official charger, or a trustworthy off-brand charger, should be negligible. Recommendation: use a lower-power charger which will charge it less quickly. It’ll charge slower, and last longer. This nexus of interaction, immersion and narrative has the potential to become the de facto delivery system for entertainment in the future. VR Noir‘s producer, Nathan Anderson, laid out his commitment to this new style of production in an official statement accompanying the app’s release. Very early days, and there must be limits to where/what you can view. Charles, I don’t think the analogy between TVs and smartphones is valid. American TVs were built in the US, more expensive to produce. And inertia in production methods. This isn’t the case with smartphones which are already sourced internationally, and already operate in an international market. Chinese firms can only undercut on price by cutting their margins. But that already exists as a strategy in the US.